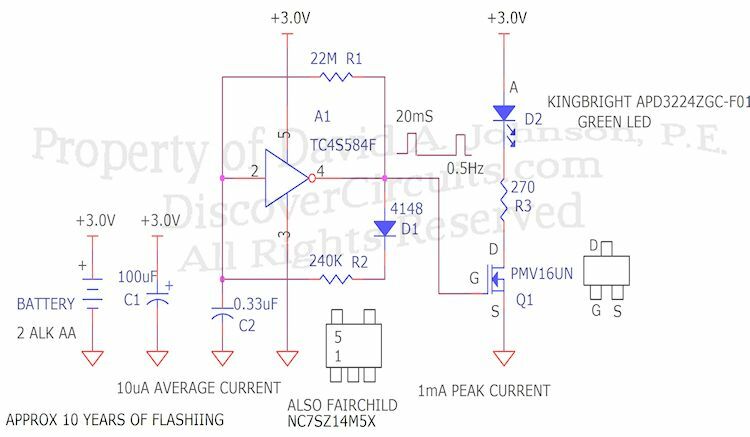 Circuit: Fake Security TV Camera LED Flasher - August 16, 2017 __ Circuit designed by David A. Johnson, P.E. After having my doorbell rung several times in the middle of the night by some kids, I decided to install some fake TV cameras around the outside of my house. I was not satisfied with the LED lights on the cameras. The heavy current drain of the original circuit meant I would have to replace the battery every few months. So, I removed the original LED driver and added my own simple flashing circuit. The circuit used a single Schmitt trigger pulse generator, which applied a 1ma current pulse to a highly efficient green LED. Flashing at a rate of about once every two seconds, the average current drawn from the 3 volt power supply was about 10uA. The current is so low that the two AA 1.5v cells should last many years before needing to be replaced. 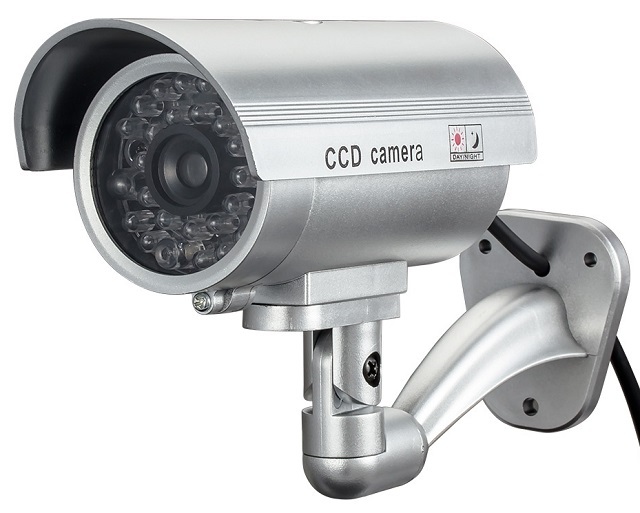 The LED flash is bright enough to be seen day or night and gives the fake camera a real “live” look.